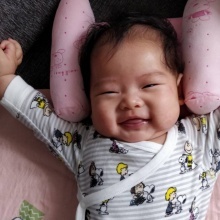 My maternity leave just whizzed by like that and I am already back to work for the second week.The first month of motherhood was tough and it did get better when I got more control and got the hang of things. It also got better when I know Sesame's patterns and when her routines are more fixed. It definitely felt better when Sesame became more interactive and more smiley. Join our community! Download the app, and get updates from eelsh. Remove this bar by logging in.